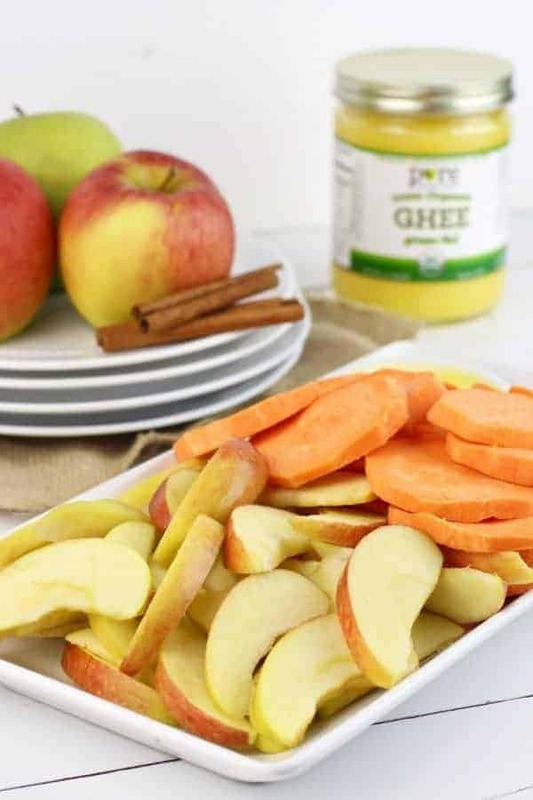 Cinnamon Sweet Potato Apple Bake is a perfect addition to your real food table this time of year! 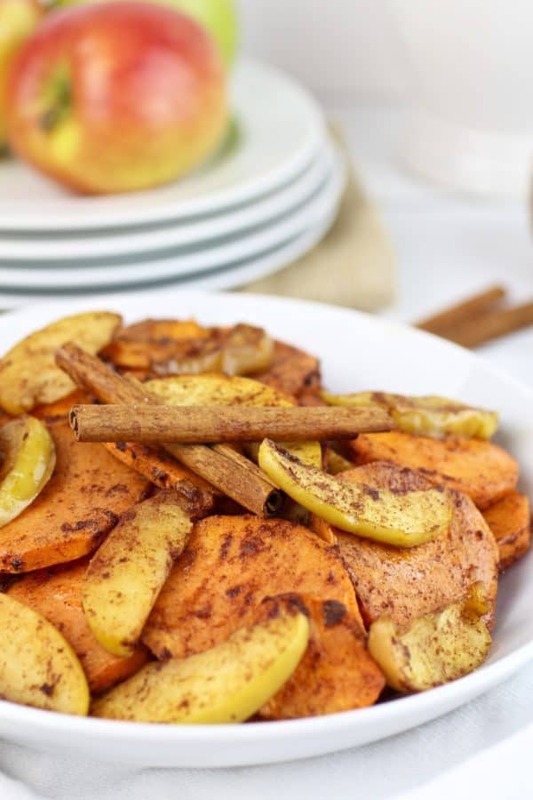 Kick off your Fall cooking by adding Cinnamon Sweet Potato Apple Bake to your menu. This morning in Minnesota it was just shy of 50 degrees. So I took a moment, with my coffee in hand, and stepped outside on to my peaceful 5 acre property surrounded by fields as far as you can see, to ‘just BE’. All I wanted to do was to breathe in the crisp air, take in the sights of the golden crops, and enjoy all of the scents of harvest. Fall is my most favorite season! The smells, the weather, the colors, the clothes, coffee seems to taste better and……the FOOD! Yes, the food, I love all in-season Fall foods. Sweet potatoes, winter squash, apples, pears, Brussels sprouts and more. I also love the heartiness of the traditional in-season meals and recipes such as stews and soups, baked dishes, cooked fruits and slow cooked meals. Lucky you, because today I’m sharing with you one of my favorite Fall side-dishes that was introduced to me by my dear friend, Ana. Ana is mother of 4 boys so for all you Moms out there, I can assure you that this recipe is not only easy to make but is kid-friendly too! Serve this side-dish with a tender pork roast and a veggie of your choice! 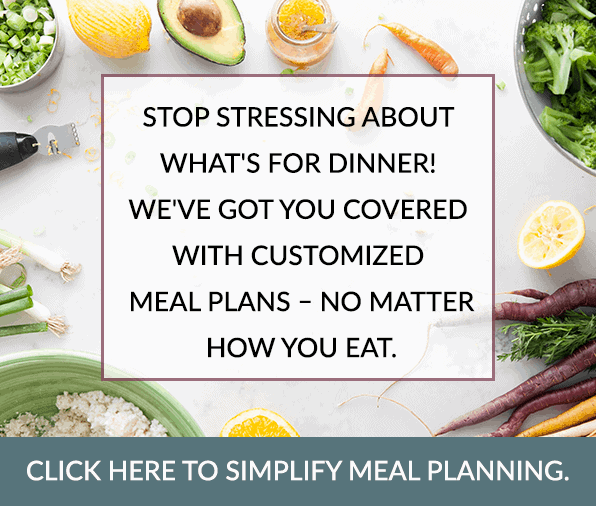 If you have followed our blog for awhile now, you probably have noticed that we LOVE simple recipes with short ingredient lists. We just feel that it’s not necessary to spend hours upon hours in the kitchen just to make one healthy meal. Your time is valuable and you’ve got a life to live outside of the kitchen scene. 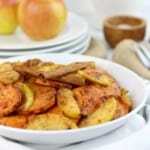 This Cinnamon Sweet Potato Apple Bake fits the bill on all of these accounts. 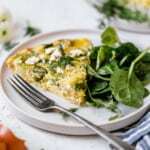 With only 4-ingredients and 10 minutes of prep time you’ll have this healthy dish whipped-up and in the oven in no time. 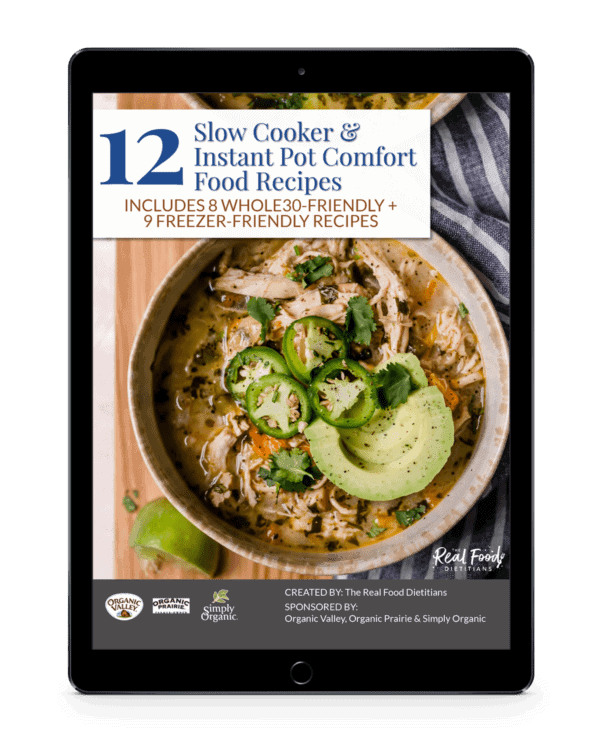 Serve it along side with a tender pork roast and a veggie of choice such as our Roasted Brussels Sprouts and bam – a delicious dinner is served! 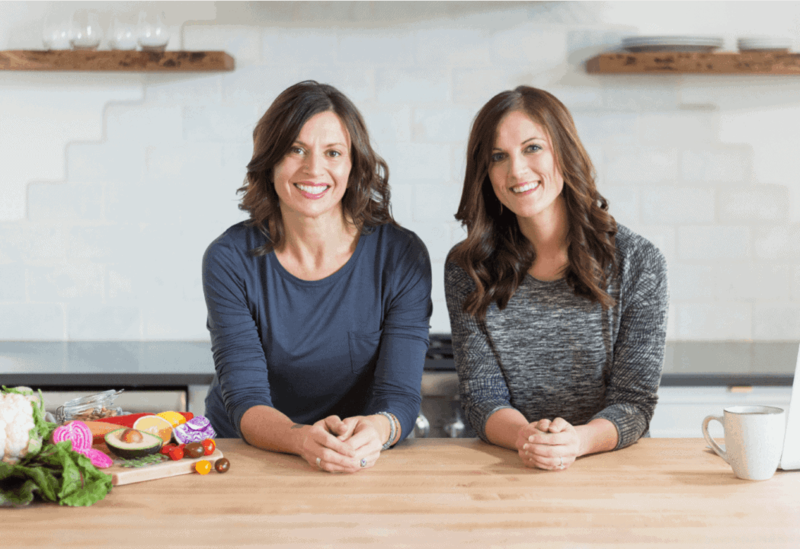 But whether you’re doing a Whole30 or not, this recipe is one you want to try and one your entire family will love. Additionally, it provides a good source of soluble fiber and is rich in vitamins, antioxidants and phytonutrients! 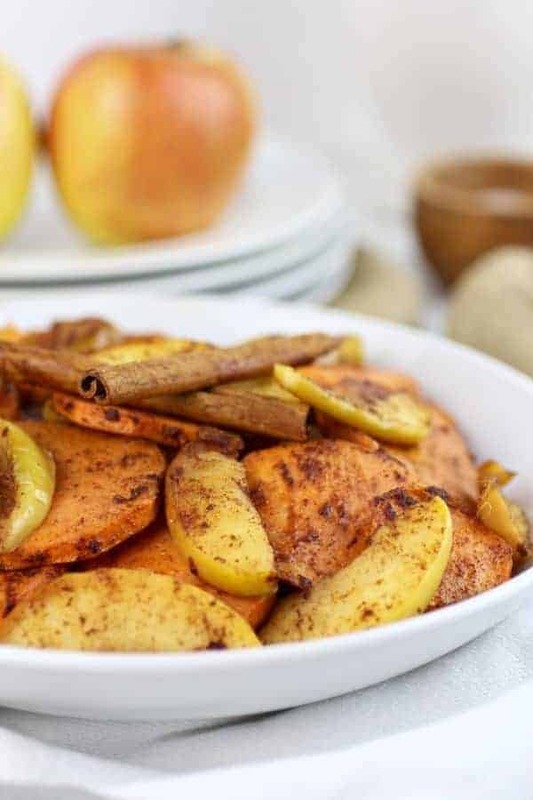 Cinnamon Sweet Potato Apple Bake is made with our favorite real food fat. During the clarification process, milk solids are removed, leaving the healthy butter fats behind. Small, trace amounts of casein and lactose can possibly remain in the ghee, but unless a person is extremely sensitive, consuming ghee will be fine, even if dairy is not. Note: if you must avoid dairy at all cost or you follow a Vegan diet, you can simply substitute coconut oil in this recipe. What kind of apples to use in this recipe? Great question! Fall is the time of year when apple picking begins and there is an endless crop of apples at our fingertips. Apples come in several different varieties – different colors, textures, sweetness and overall taste. Some are better for baking and some are better for eating. 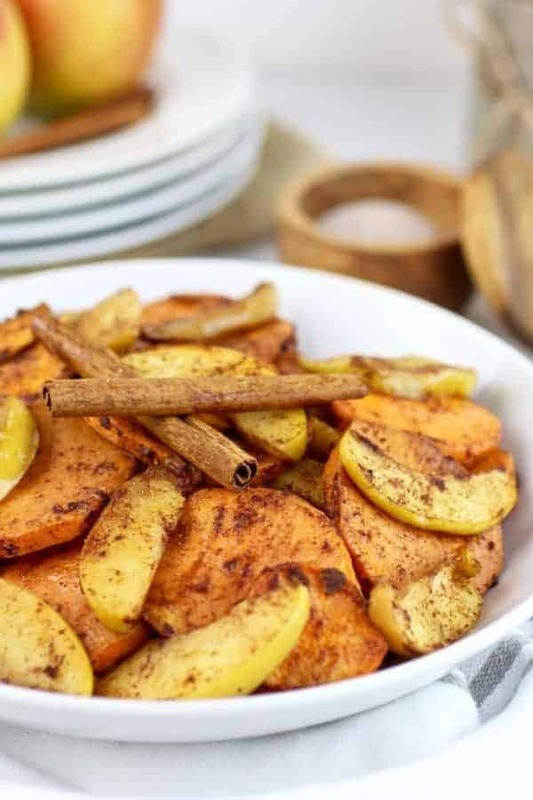 Because there are no added sweeteners in this recipe, Cinnamon Sweet Potato Apple Bake is made best with a sweet, crisp apple. Pink Lady, Honey Crisp and Braeburn all work great! Apples are best to be purchased organically and that is because of the high amounts of pesticide residue on conventionally grown apples. 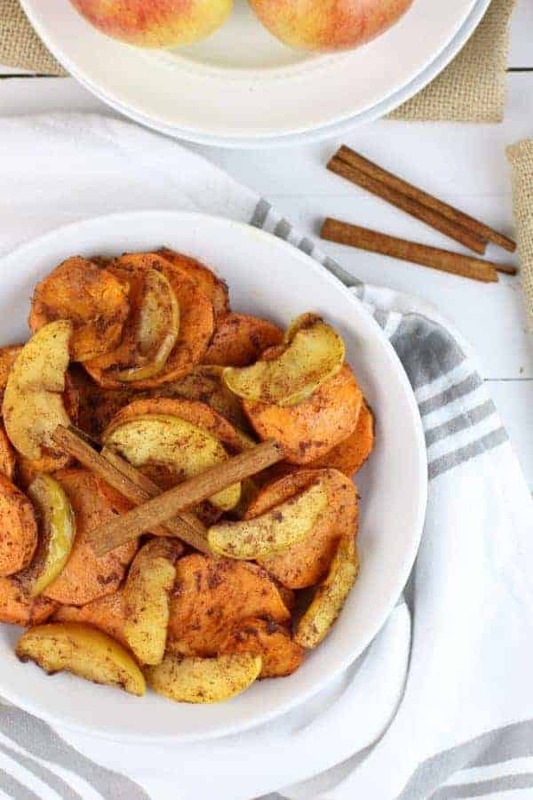 It’s time to gather the ingredients and get this Cinnamon Sweet Potato Apple Bake in the oven. Bonus: it will make your home smell ‘fall-like’ AMAZING! A perfect Fall side-dish for your real food table. In a casserole dish, combine all of the ingredients except for the salt. Mix until apples and sweet potatoes are evenly coated. Cover with foil and bake in oven for 30 minutes. Toss sweet potatoes and apples halfway through baking time. After 30 minutes, remove foil, stir and bake for an additional 15-20 minutes or until sweet potatoes are cooked through. Tossing again halfway through baking time. Remove from oven, dash with just a little sea salt if desired, and serve! What’s your favorite variety of apples? Comment below! 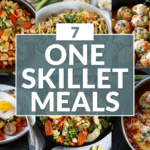 We’d love to hear if you give this recipe a try! OR snap a photo of the recipe and share it with us on Instagram by tagging @therealfoodrds or using the hashtag #therealfoodrds! Hi! 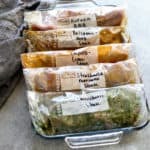 I just discovered your website and am loving all the recipes! What type of apples do you recommend using for this?! Awesome!! You can use any type of apple in this recipe 🙂 If you prefer more tart, go with Green Apples. My senior client and I both love apples and sweet potatoes, I plan on cooking this tomorrow along with chicken tenders for the protein. She loves sugar as with most seniors, so a little sprinkle of brown sugar wont hurt. 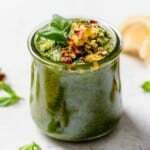 Thank you for such a simple and nutritious recipe, her kitchen usually lacks ingredients for recipes calling for umpteen different things so this is perfect! This is great – thanks for sharing. 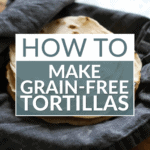 You’re right about this recipe being simple and delicious. I hope you both enjoy it. 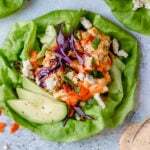 I love how healthy, easy, and delicious this recipe is. I made an extra large batch yesterday to ensure I would have some leftovers, and I had to have some for breakfast today.